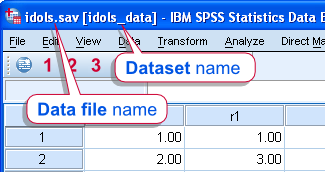 This tutorial explains what SPSS datasets are. For a practical tutorial on working with datasets, see SPSS Datasets Tutorial 1 - Basics. Right, now an SPSS dataset is SPSS data that only exists in your computer's working memory (RAM). Changes you make to it are discarded unless it's saved as a data file. "SPSS data file" refers to data that exists on a storage device (such as a Hard Disk or a USB stick). Obviously, switching your computer off and back on does not affect an SPSS data file. By opening an SPSS data file, it's copied to your computer's working memory (RAM). This copy is referred to as an SPSS dataset. Importantly, changes you make to a dataset are recorded only in working memory. Such changes are therefore discarded if you close a dataset (perhaps accidentally). This is usually no big issue as long as you work from syntax. In this case, just reopen the data file and rerun the syntax you used for your modifications. Starting from SPSS version 14, you can have multiple Datasets open at once. However, there's always one active dataset. This is the only dataset to which the commands you run are applied. (An exception are commands that may address multiple datasets at once such as ADD FILES). The active dataset is usually the one you opened last. However, you can switch to a different one with the DATASET ACTIVATE command. In order to distinguish between open Datasets, you can assign a name to each with the DATASET NAME command. When desired, these names can be used in syntax for explicitly addressing different datasets. Thanks for your comment, this is a really old tutorial and pretty outdated. I'll rewrite it from scratch as soon as I'll find the time. This was helpful, but could you discuss all the different things you can do with the dataset command? Like dataset close?